Holding a handful of oyster spat: It takes about two years in Maryland to grow an oyster. Standing next to Acting Under Secretary Doug O’Brien (foreground) is Terrance Taylor, representative for Congressman Steny Hoyer; Letitia Nichols, Business & Cooperative Program Director and Michael Dee, President, The Patapsco Bank. 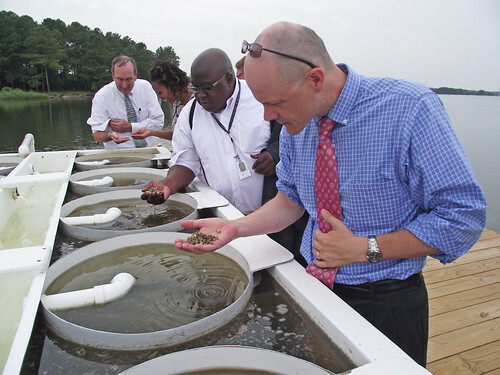 USDA has guaranteed a bank loan that will help the oyster operation grow and also protect Chesapeake Bay. USDA photo. Earlier this week it was my honor to join USDA Rural Development Acting Under Secretary Doug O’Brien and Patapsco Bank President/CEO Michael Dee to announce funding support for one of Maryland’s favorite delicacies – the Chesapeake Bay Oyster. True Chesapeake Oyster Company has found what the company believes is the perfect place to grow an oyster. St. Jerome Creek, located near the midpoint of the Chesapeake Bay, is the nursery grounds for their not-too-salty, not-too-sweet oyster. The company was launched in 2010 and since then has grown by leaps and bounds. Its clean, crisp oyster, called the “Skinny Dipper,” was introduced at Pimlico Racecourse during the running of the 138th Preakness Stakes, where some 11,000 oysters were shucked and served. USDA first communicated with The Patapsco Bank in Baltimore in March to explain how Rural Development’s Business & Industry loan guarantee program could help the bank and its business clients. As a result of the conversation, True Chesapeake Oyster Company secured a loan, guaranteed by USDA, to support shoreline restoration and repair an existing pier at its oyster growing operation in St. Jerome Creek. 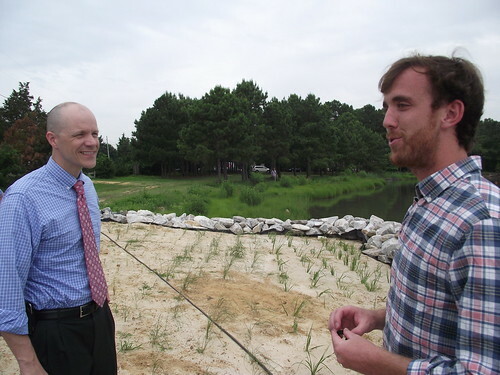 Restoration effort: Acting USDA Under Secretary Doug O’Brien with Patrick Hudson, Operations Manager, True Chesapeake Oyster Company. In the background is some of the shoreline restoration that USDA funding helped support. USDA photo. The company sells oysters in Washington, D.C., Baltimore and in Annapolis. USDA Rural Development has increased its marketing efforts to promote the Business & Industry Loan Guarantee Program by meeting with top executives and loan officers at financial institutions throughout the state. It takes approximately 2 years to harvest an oyster from seed to consumption. 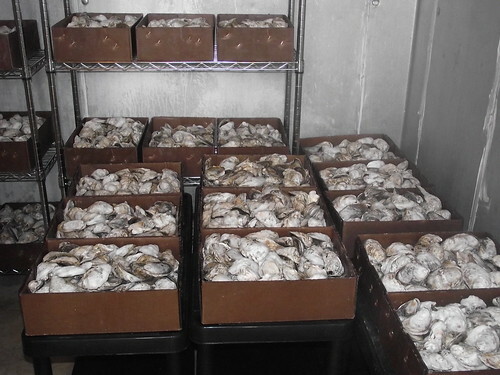 Oysters, ready for sale are boxed in lots of 100 for shipment to market. USDA photo.